Botnhamn is a small and beautiful place in Northern Norway, located more than 300 km north of the Artic Circle. The place is spread out along the fjord of Stonnesbotn and surrounded by high mountains and the deep, blue Atlantic Ocean. With a population of only 500 the place is very peaceful and charming. Botnhamn experience nice and warm summers, but long and dark winters. During the summer months of June and July the Midnight Sun is shining the whole night through in a splendid spectacle of lights and colors! This place is truly a gem! Malangsforbindelsen ferry link from Botnhamn to Brensholmen, connecting Senja with the island of Kvaløya, is a beautiful and scenic trip across the Malangen strait. Click here for departure times or read more about Malangsforbindelsen here. In the Neighborhood section you can read and see pictures of the localities and neighbor villages, including Gavlen, Laukvik, Baltsfjord, Husøy, Fjordgård, Senjahopen, Mefjordvær, Lysnes, Gibostad, Finnsnes and Tromsø. In the Photo Albums section you will find a collection of both summer and winter pictures of Botnhamn and the local area. Go here to see what makes this place so special! Now updated with pictures from 2007. Botnhamn is located on the island of Senja in Troms county, Northern Norway. Click on the map on the left to see where in the world Botnhamn is. If you want to take a closer look click here. See pictures of Botnhamn taken from the air during the summer of 2006 and 2007. You will see some stunning pictures of the place with breathtaking views of the mountains, sea and nature around it. Some facts about the midnight sun, the northern lights, the gulf stream and other typical Northern-Norwegian natural phenomenon. They can all be seen and felt in Botnhamn. 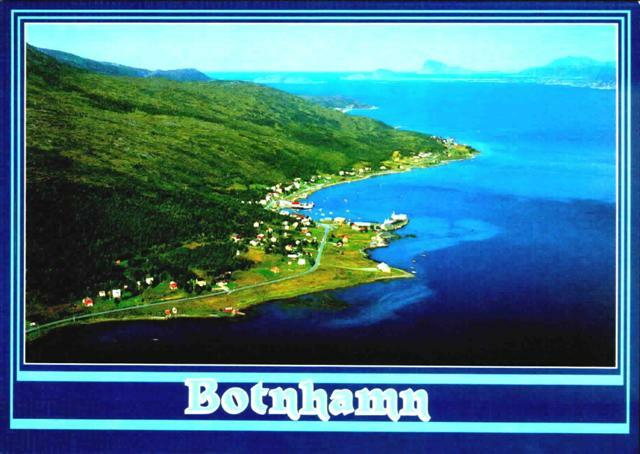 There are only a few establishments in Botnhamn; a fish processing industry, a fish farm, a local store, a school, a camping ground and some more. The Silver Treasure of Botnhamn is from approximately the year 1000 A.C., and the Botnhamn axe is the only one we know with a gold coating. How do you get to Botnhamn? Here are links to time tables for scheduled traffic to/from Botnhamn.